Fiercely protesting against the move of the Bharatiya Janata Party (BJP)-led Government to confer Scheduled Tribe (Hills) ST(H) status to the Bodos residing in the hill districts of Assam, the Autonomous State Demand Committee (ASDC) staged a protest march and road blockade in Diphu on Monday. 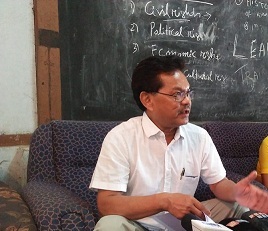 The ASDC demanded that the decision to confer ST (H) status to the Bodos be revoked pronto. A large number of people participated in the protest march and the road in front of Semson Sing Ingti Memorial Park was blocked from 11 am to 2 pm on Monday. Slogans like – ‘Let’s Make the Movement Stronger’, ‘No ST (H) Status to Bodos’ rent the air and the leaders of ASDC were present at the protest march.